It's official. Barack Obama will be the 44th president of the United States! The official election results as of today shows that Obama received 52% of the popular vote vs. 46% for McCain. The economy -- we are told -- played a large role in undermining the McCain campaign while bolstering Obama's chances of winning. 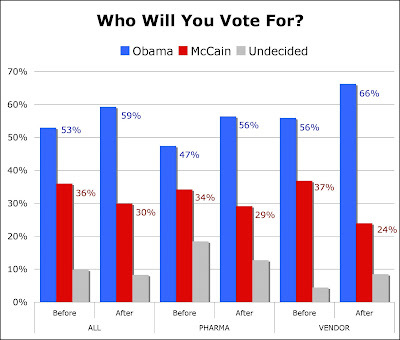 Results of the "Who's Better for Pharma: McCain or Obama" survey of readers of this blog -- many of whom work within pharmaceutical companies and live in NJ and PA -- more or less accurately predicted the outcome of this election as far back as September 19, 2008, which was just before the financial crisis hit. At that point in my survey, 53% of the 153 US respondents indicated they would for Obama, whereas 36% intended to vote for McCain. About 10% were undecided. After September 20, 2008, there was a significant shift in favor of Obama as shown in the chart below. From these results, it seems that US-based vendors selling products and services to the pharmaceutical industry were most influenced by the financial crisis. Before September 20, 2008, 56% of US vendor respondents favored Obama vs. 37% who favored McCain. US vendors responding to the survey AFTER September 20, 2008 favored Obama over McCain 66% to 24%. This difference was significantly greater than that observed for people working within drug companies. The worsening economy is likely to affect smaller vendor companies to a much greater extent than large pharma companies that have oodles of cash on hand. Sure, we're seeing layoffs at pharma companies. But so far I'm not hearing much from pharma vendor companies in terms of layoffs. I'm sure it's happening. From the comments I received, many survey respondents said their choice had more to do with changing the overall direction of the country than with how it would benefit their own personal financial condition. It's a 180-degree shift away from thinking that what's good for business -- whether it's GM or Pfizer -- is good for the US.